On a mission: NASA’s Chief Scientist Albion Bowers has all but one astronaut’s autograph to complete his collection of 31 astronauts that have flown in Apollo, Mercury and Gemini missions. 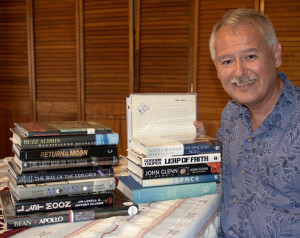 He has all 12 “moonwalkers” signatures but is still trying to find one from Apollo 1 astronaut Gus Grissom. Growing up with the “moon generation,” Albion Bowers, chief scientist at NASA Armstrong, said he has always been fascinated with the space program. 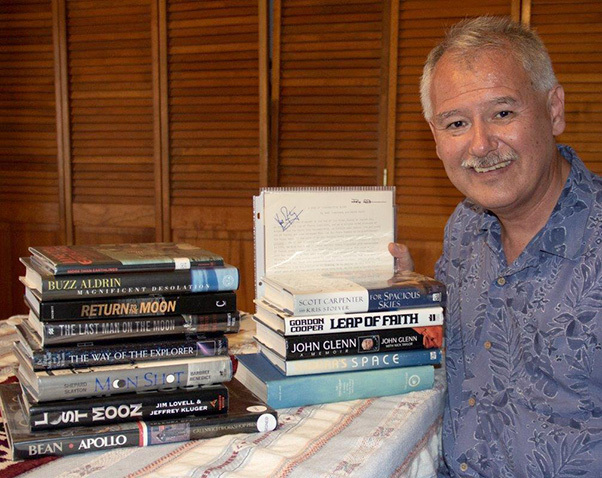 With the 50th anniversary of the first Apollo moon landing approaching, he began to look though his collection of books, photographs and postcards that were autographed by various astronauts. “As a kid I watched all of the Apollo missions,” he explained, as he proceeded to rattle off in-depth details of Apollo 11 through 16. The unbridled enthusiasm that started in childhood bubbles over even today. “There have only been 12 people to ever walk on the moon and I realized I had two signatures, and decided to gather the remaining 10 for a complete collection.” He started his research in mid-January and by the end of March, his mission was complete. “We had six astronauts alive when I started, now we are down to four.” He realized some of those astronauts also flew other Apollo, Gemini and Mercury missions and thought about collecting more signatures, not only of moonwalkers but all pre-shuttle astronauts. 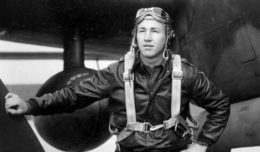 “Since I had several, I thought I would gather several more — it started to sort of take on a mission of its own,” said Bowers. With the recent passing of John Young and Al Bean, Bowers knew their autographs would be tough to acquire but that did not stop him — he would just have to become a little creative. Harrison Schmitt’s signature (Apollo 17) was purchased on Amazon in the United Kingdom, but since Amazon would not ship to the United States, Bowers had a friend of a friend on Facebook help him out. He has also learned to tell the difference between an autopen and a human signature. “Of course Neil Armstrong gets copied a lot but you can tell by the strokes and dots, if it is made from a machine or not.” He acquired Pete Conrad’s signature from a cancelled check that was used to pay his phone bill. Another prize came in the form of a Bible tract signed by Jim Irwin, who became an ordained minister. He has personal autographs from Buzz Aldrin and Jim Lovell, and recently bought three limited-edition prints signed by Alan Bean. “Gus Grissom is the only signature I need to complete my 31 signatures from all of the astronauts of the first space missions,” explained Bowers. Virgil Ivan “Gus” Grissom was the second person to fly into space and was killed in 1967, along with fellow astronauts Ed White and Roger Chaffee, during a training exercise and pre-launch test for the Apollo 1 mission. “I’m hoping my sons will want the collection. I would like to keep it in the family,” said Bowers. He figures he has spent about $2,500 gathering signatures and saw that a piece of paper with all 12 moonwalker’s autographs was going for $42,000.